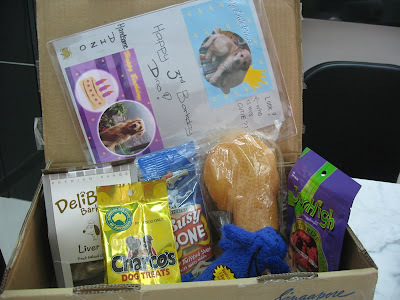 Mom couldn't believe her eyes when the postman delivered this package for me! It's the biggest present I have ever received! The Four Musketeers contacted mom for our address because they wanted to send me a birthday gift. 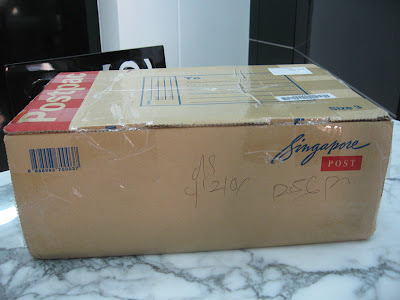 Since Mom is in Singapore, she gave them a Singapore address to send it to. It is filled up with so many goodies! 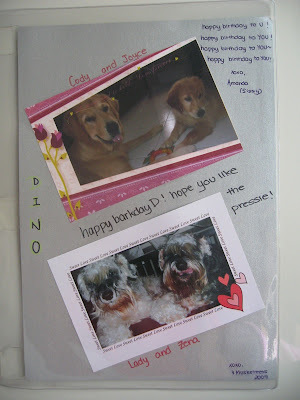 A beautiful double sided birthday card! Look! They even included a puppy pic of me! Mom told me all about it and I really can't wait to see it! I will have to thank you all personally when I get home. A BIG thank you to Cody, Joyce, Lady, Zena and their Sissy for their very generous gift. We are all very moved by it! Muah! Happy 3th Barkday, Dino. We love you! Nice pressies from the 4 Musketeers! They sent you pawesome presents! I am sure you love them all! Happy belated barkday Dino! Oh wow, that's a huge parcel! Such pawsome presents! So many goodies! And that picture of you! WOW! Wow! You got one too! How pawsome! Is it a Size 5 box too? It sure looks like it! Those are some amazing prssies you got there. The Four Musketeers are just KOOL!!!! those are just lovely, lovely pressies you have there buddy! we cant wait for your mum to come home and show you your pressies.. I bet you'd be jumping happy!!! You are just the cutest labrador puppy in the world! Too adorable for words.. and getting even more handsome by the minute, too.. I'd say. What a great big present you got. I hope you get to enjoy those goodies real soon. Cant wait to see D looking at the pressie !! you're very very very lucky!!!! The 4 Musketeers are special friends!!!!! can't wait to see you opening these wonderful gifts!!!!! Hi Dino! Wow, what a great present from such nice friends! Zeke and I will be glad to see you when you get back. Happy Birthday, Dino! What lovely presents you've got! Oh what nice friends you have. Happy birthday! I'll be 3 in August! 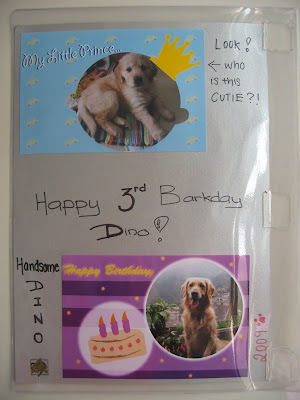 Happy Barkday Dino! You got pawsome pressies from The Four Musketeers! They are so cool! Happy Valentine's Day! Hope you get lots and lots of pats and smooches! Hope your Valentines Day is filled with extra kisses, treats, hugs & belly rubs!